Thallus: verrucose, usually well developed but sometimes almost immersed surface: intensely yellowish green cortex: 22-34 µm thick, in the lower part densely inspersed with yellow crystals; outermost part: with a hyaline layer Apothecia: immersed in verrucae, 0.5-0.8 mm in diam mazaedium: 0.2-0.5 mm in diam., black, epruinose exciple: thin throughout, 14-34 µm thick laterally, not or only slightly thickened at the base, composed of intricately interwoven, brown, sclerotized hyphae with thickened walls; hypothecium: very thin, poorly pigmented asci: ellipsoidal to pyriform, 15-24 x 7-10 µm, rupturing at a very early stage, with 2-3 seriate spores ascospores: brown, 1-septate initially, becoming submuriform with oblique septa, broadly ellipsoid or irregular and very variable shape and constricted at the septa, 17-24 x 13-18 µm, smooth, with 2-14 subspherical or angular cells Pycnidia: at first spherical to ellipsoid, 55-100 x 55-70 µm, later irregular, confluent with other pycnidia to leave incomplete walls delimiting aggregates of numerous loci; pycnidium aggregates: irregular, up to 0.3 mm wide, sometimes with one or a few longitudinal slits opening to the loci; wall: 7-15 µm thick, consisting of isodiametric or slightly elongated, hyaline cells c. 1 µm in diam. ; in the uppermost part the wall: cells spherical, 3-4 µm in diam. and heavily sclerotized, blackish brown; conidiogenous cells: 2-2.5 x 1.5-2 µm, short cylindrical, terminal and in branched conidiophores also produced laterally conidia: non-septate, hyaline, cylindrical, 3.0-4.0 x <1 µm or ellipsoidal, 3-4 x 1.5 µm, both types occurring on the same thallus Spot tests: thallus K-, C-, KC-, P- Secondary metabolites: thallus with rhizocarpic acid. Substrate and ecology: on wood World distribution: widely distributed in the boreal and temperate zones of Europe and North America Sonoran distribution: southern California. 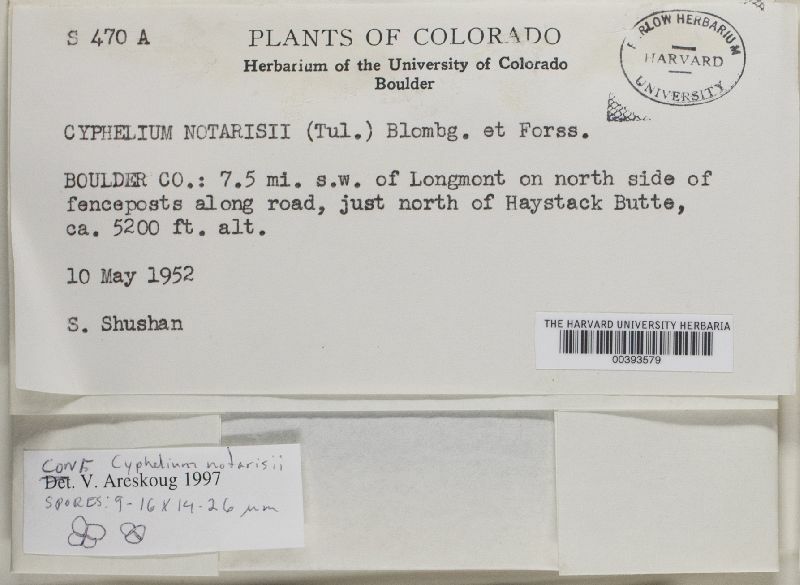 Notes: Cyphelium notarisii is characterized by its immersed ascomata, its intensely yellowish green thallus and its submuriform, irregular and large spores. In gross morphology, it is indistinguishable from C. tigillare, but differs in having submuriform spores. It also has a more southern/ low altitude distribution. The thallus is often almost sterile and provided with irregular groups of conspicuous, irregular, black, multilocular pycnidia. Very similar pycnidia are also present in C. tigillare. Completely sterile thalli with abundant pycnidia cannot be identified, since such thalli may also be produced by C. tigillare. Two different types of conidia are produced by C. notarisii, and both sometimes co-occur on the same thallus.